OSHA Forklift Inspection Requirements, Receive Forklift Training Today! Forklifts that are used on a day-to-day basis work hard and experience their fair share of wear and tear throughout their lifespan. As operators, it’s important to know when should a lift truck inspection be performed to ensure the safety and efficiency of the lift and the operators. Learn everything you need to know about OSHA forklift inspection requirements and where you can find the best forklift training to further prevent accidents and forklift damages. In order to create a safe working environment, it’s important that all of your equipment – especially powered industrial trucks – perform without flaw. One of the best ways to ensure that is to follow OSHA forklift inspection requirements. This will help avoid accidents and injuries, and also save money, since a properly working forklift or pallet jack lasts longer than neglected equipment! With CertifyMe.net training, you’ll have all the forklift inspection requirements and tools you need to improve overall safety at your workplace! How often should operators inspect their forklift? According to OSHA under regulation 1910.178(q)(7), all forklifts must be inspected before being placed in service. Inspections must take place either daily, or after every shift if the forklifts are being used around the clock. Forklift inspections must also take place in a safe environment away from hazards, and only by trained personnel in accordance with the manufacturer’s instructions. The forks on a forklift must also be inspected for defects and damages, at least every 12 months or as soon as any defects are noticed. Once these basic OSHA forklift inspection requirements are met, forklift inspections can take place, starting with the pre-operation inspection. The pre-operation OSHA forklift inspection requirements are meant to be done without the engine or battery on and running, and to check for any damages that can affect safety. 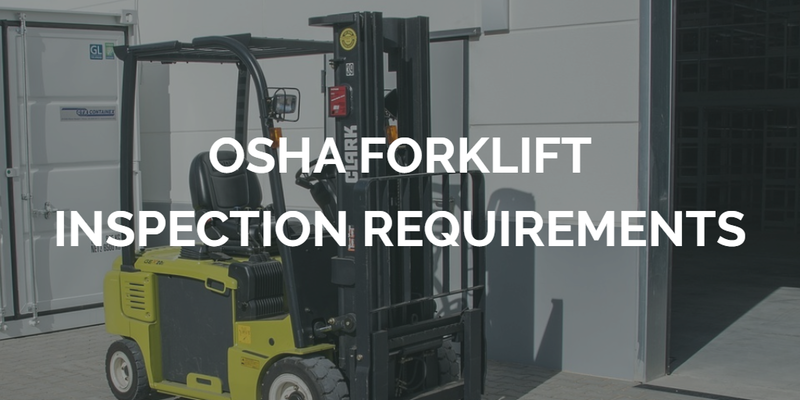 According to OSHA forklift inspection requirements, forklifts that have any defects or need maintenance must be pulled from service and not operated. If you have any doubts about what defects or maintenance issues cause a forklift to be removed from service, consult with your safety supervisor. They can fully explain OSHA forklift inspection requirements, and how they impact forklift use. If you notice any leaks, fire, or overheating, stop operating the forklift and immediately report the condition. These are hazards that can lead to serious accidents. OSHA instructs that only operators who have been properly trained can operate forklifts and perform forklift inspections. Aspiring operators must complete a forklift training program that involves formal written instruction, video and interaction computer learning, practice training, and a skills evaluation. They don’t specify how this training must be conducted, and luckily for you, that means that you can choose CertifyMe.net for the easiest and fastest OSHA-compliant training available. Our training covers all of OSHA’s requirements for forklift training, and teaches everything operators need to know to work with forklifts and perform inspections, including OSHA forklift inspection requirements. We also offer an online platform that can be accessed from any device with an internet connection, at your own pace, and completed in only about one hour. That’s right! Sign up for one of our online forklift classes today and receive your certificate immediately upon completion! If you have any questions about forklift inspection requirements, or if you’d like to speak with our safety compliance consultants about OSHA forklift inspection requirements, give us a call at 1-888-699-4800. Thanks for considering CertifyMe.net for your forklift inspection requirements needs – we’ll show you how to implement an effective, easy-to-implement inspection program with our proven forklift training courses.